Take a likeable person, a fascinating biography in two countries and flavour it all with the in-topic of cooking – and the result is a wonderful book for many tastes. When Tom Franz won the Israeli version of the competitive television cooking show MasterChef in 2013, he had already been living as a converted Jew in Israel for nine years. 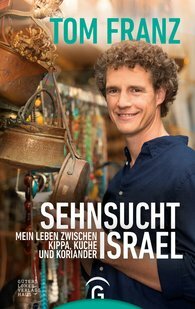 The popularity of the "culinary ambassador" and "bridge builder" between Israel and Germany is closely connected with his special vita. In this book Tom Franz tells us how a lawyer with little passion became a passionate chef and Jew.